Is Reading Joke Books Real Reading?? YES. Reading joke books IS real reading. Some young readers, especially reluctant ones, will happily read 15 pages of a joke book before they'll read a chapter book. For independent reading, encourage that. Jokes require the reader to not only practice their decoding skills, they also have to think about phrasing and intonation as they pose and answer the joke. A lot of jokes play on words and so the reader also has to think about the multiple meanings of a word and infer why the joke it funny. Best of all, they are interactive and engaging. You can't be a passive reader when reading jokes if you want to understand them. 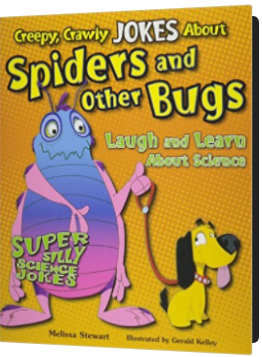 Our latest HOT READ guest, Mr. Ferriera, shared a joke book about insects (pictured below). Check out JMRL and the Venable Library for a treasure trove of fun joke books for kids. Matchmaking Between Books and Kids - A Match Made in Heaven! It's new year's resolution time. You know and I know that we're not sticking to our resolutions unless they're worth our while. It's the same with books and kids. Every kid WILL read if they can get their hands on a book that is worth THEIR while. Looking for the right book for your readers? Look no further. The Nerdy Bookclub is one of my all-time favorite sites for finding just the right book for each student. And they just put up the 2016 Nerdies for categoris such as picture books, early reader, middle grades readers, etc. If you love Elephant and Piggie you will LOVE this new series called Elephant and Piggie Love Reading - Gerald and Piggie introduce and wrap up the book they have enjoyed reading. 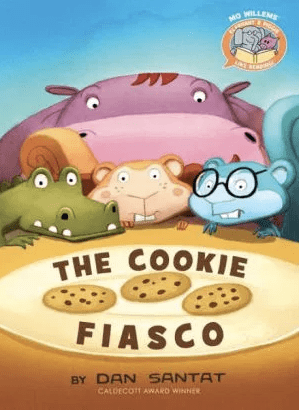 The Cookie Fiasco and We Are Growing arethe first in this series. Check out the Nerdy Book Club 2016 Nerdies. I am rebooting this blog and website! This year at Venable is shaping up to be VERY exciting. We are focusing on writing across all grades. We have been working together to look at student writing, assess our goals as a school, and dig into planning writing instruction and practice for our students. At the same time, we are focused on getting our students to be reflective and self-directed learners. This means we are asking them to set goals and monitor their progress towards them. Writing is a great place to do this and we are already seeing kids editing and revising with checklists and rubrics to improve their writing. In the spring we will be doing Student Led Conferences in all grades. Your children will be so thrilled to show you and talk about their grown in their reading and writing. We are also hyping up reading with our monthly HOT READ at our new school-wide morning meetings. Each month a different staff member will highlight and booktalk a favorite book. 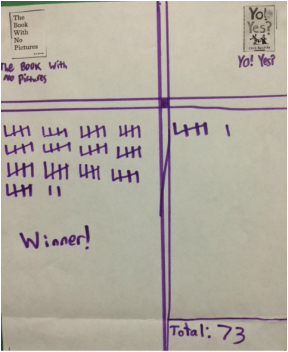 Our first HOT READS were Yo, Yes by Chris Raschka, and The Thank You Book by Mo Willems. You gotta see it to believe it! And lastly, check out my page of Favorite Websites (self-explanatory) and also Literacy FAQ (this is where I will highlight a common question or concern I hear from teachers and families and hopefully provide some additional resources for readers to learn more about it. ​So welcome back and happy reading and writing everyone!! "The Day the Crayons Quit" Is our Champion!!! 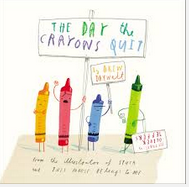 It was a close race but in the end "The Day the Crayons Quit" beat "The Book With No Pictures" by a mere 12 votes. 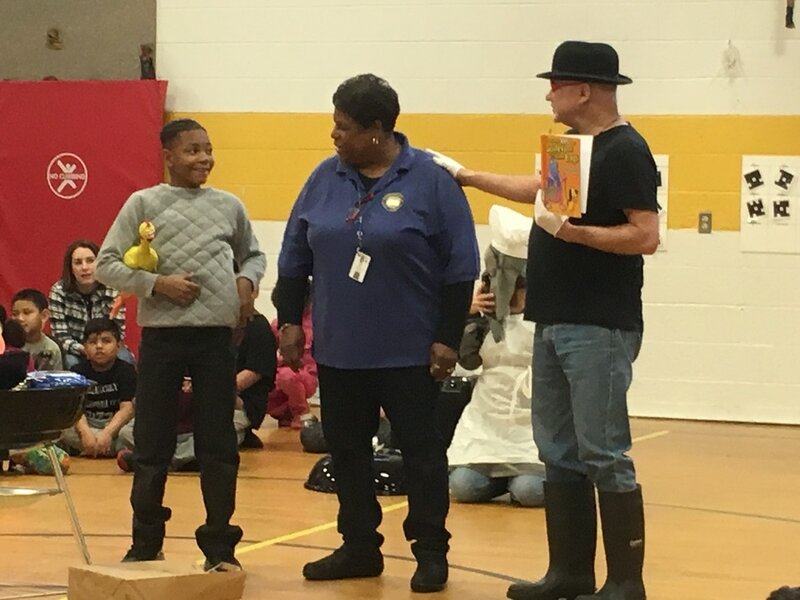 While voting in this last round, I overheard a first grade class discussing what makes a great book and they decided that a great book has a good story with good characters, and that you could read it again and again without getting bored. This class voted almost unanimously for "The Day the Crayons Quit." They decided that while they enjoyed "The Book with No Pictures," the novelty of it had worn off after several readings. Thanks to all of our All-Stars for participating in March Book Madness. Sharing books and talking about them as a whole school community was fun and engaging. Ms. Cartwright and I are already planning for March Book Madness next year so we can get an earlier start and have more book copies available for more teachers. Here are a few final pictures of a third grader doing the FINAL tally. It is ON! Our final round of reading and voting is between "The Book With No Pictures," and "THe Day the Crayons Quit." A number line can be used to illustrate how many votes each book received. An Area model can be used to display voting data. My personal favorite - students used lego to build 3D models of the voting data. The votes have been tallied! 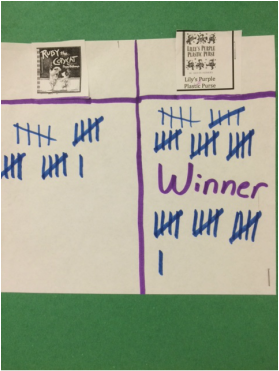 You can see the winners from our first round of reading, thinking, choosing, and voting. With at least 2 snow days during the kick-off of March Book Madness, plus our Vocabulary Parade, plus a lot of other stuff, we had to take a more surgical approach to making sure groups of students read and voted on each book - so not every student in the school got to hear and vote on each book this time. Principal Kershner and Assistant Principal Paige have read several of the pairs of books to the 2nd, 3rd, and 4th grade classes during their lunchtime. Reading aloud to students in the cafeteria is a well-established practice here at Venable - kids love it, and it helps maintain calm during lunch. Several other teachers participated in this first round of voting: Mrs. Greenwood and Mrs. Minor in Kindergarten, Mrs. Hunter and Mrs. Foraste in 1st grade, Mrs. Shook in 3rd grade, and Mrs. Scudder in fourth grade. This next round will give more teachers a chance to participate. 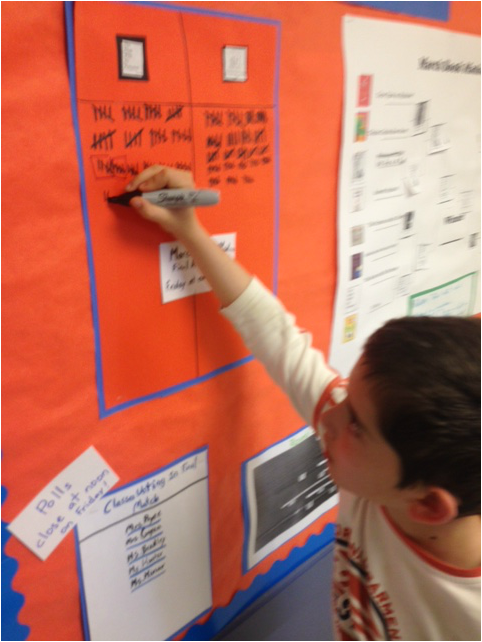 Mrs. Cartwright's third grade students took charge of collecting, tallying, and recording the data from the votes. Below are a couple of pictures of their work - you can see how they are applying their math skills to help facilitate this awesome school-wide literacy event. 1) Because of snow days and early dismissals we never had a chance to share this in person with the whole staff - it's been amazing how much support we've generated via email and one-on-one talking it up. 2) Two of the books we chose were actually unavailable and so we made last minute changes. "The Right Word" appears to be unavailable at JMRL as well as Amazon and B&N - so we used "Ruby the Copycat" by Peggy Rathmann instead. And our copy of "Waiting is not Easy" went AWOL so we used "We Are in a Book" also by Mo Willems. 3) We only had multiple copies of a few of the books, next year we will plan further in advance and make sure we have multiple copies so that more teachers can participate at the same time. OK - stay tuned for ROUND TWO MARCH BOOK MADNESS!!!! We will celebrate March Madness with a book bracket. Students will listen to books and select their favorites in a bracket-style voting process over the course of the month. In some cases teachers will read aloud some of the books to their classes. In others students will enjoy listening to Mrs. Kershner and Mrs. Paige read-aloud the books over lunch, as they typically do every day. 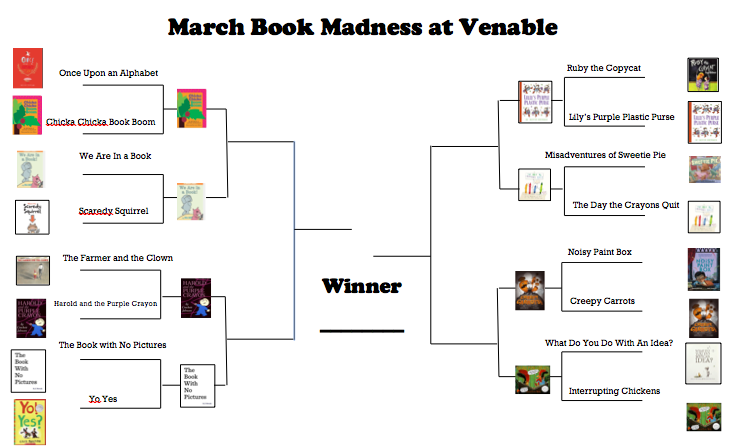 Students will vote on their favorite choices until we narrow down the Venable All-Star book choice for March. Large posters of the brackets will be posted in front of the Venable library and outside the cafeteria so we can observe the choices in progress. Students will help gather and tally the data. I will update the brackets on this blog over the course of the month. Each bracket includes one book published in 2014 and one classic. We encourage you to read the books at home as well and track your voting choices as a family. Below is a PDF of the brackets. How do you make your voting choice? Here are a couple of guiding questions you can ask your child (or yourself) when making your choices. For older kids: If you were going to live on a desert island and could only take ONE of these books, which would you take? Remember this would be your only book AND you would be rereading it over and over again. What is it about your choice that would make it a better book to read again and again? For younger kids: If you were going to give one of these books as a present to someone you love, which one would you give them? Which one would the want to read over and over again? Which one would YOU want to read it over and over again? Our district is implementing learning targets as way to involve our students in their own learning. 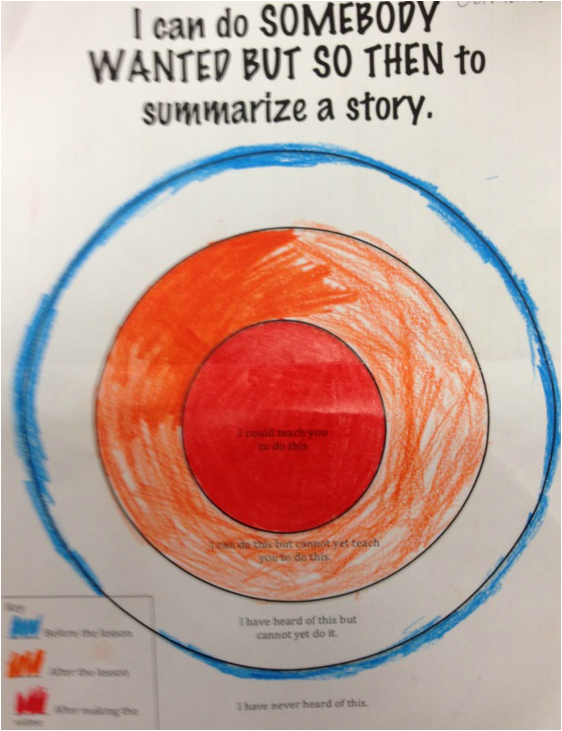 A learning target is an I CAN statement in kid-friendly language describing the learning the teacher expects. 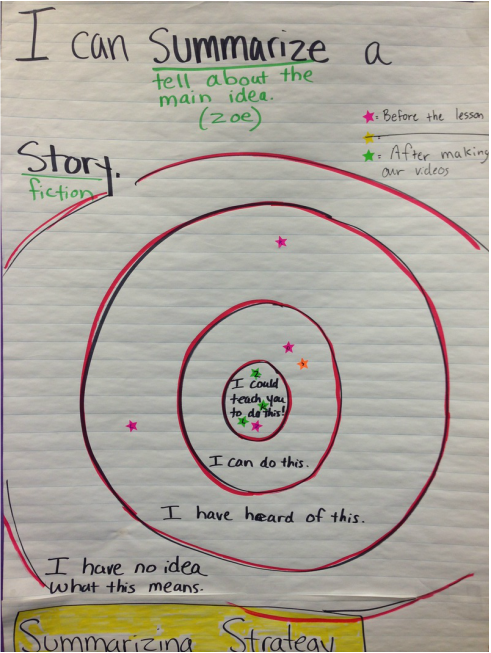 You can see the star stickers - that is where students have assessed their own knowledge of this learning target BEFORE the lesson, AFTER the lesson, and after guided and independent practice. we practiced the strategy with a whole ton of folk tales - they are fun to read and lend themselves to this strategy. We made little instructional videos about using the strategy. I am working on learning how to embed a Youtube Link to their videos. They are awesome. In the meantime, here is a link to a very creative teacher's OWN music video he created to teach his own students this very strategy, set to the tune "What does the Fox Say?" In first grade intervention we read a book called Making Soup. This inspired our own soup-making adventure! First, we brainstormed ingredients. Then we made the soup and ate the soup. Finally we wrote down the steps we took to make the soup. This became our recipe! Here are a few photos of our soup making adventure. It was delicious! Kids got to take home extra soup and the recipe. We are now working on writing captions for all the photos so that we can all have a copy of the book we made. What IS the deal with these Guided Reading Levels at school???? There are several leveled reading, or text gradient, systems utilized in schools, but at most elementary schools these days you will hear teachers refer to Guided Reading Levels A-Z. We prefer guided reading levels to Lexile levels because Lexile levels consider ONLY sentence length and word frequency.while guided reading levels consider a those factors AND content, vocabulary, and language. There is a range of levels within each grade. Your child’s teacher can address your child's current level and the goals she is working on with your child. With good instruction, your child will steadily become a better reader, even if he is one or two levels behind peers. We use the guided reading levels to help guide our instruction AND to match readers with texts. Children can read successfully within a range of levels depending on motivation and other factors. During reading instruction, your child will read books within his INSTRUCTIONAL reading range. This means texts he can comprehend AND read with 90-97% accuracy. When reading independently, your child will be reading books at his INDEPENDENT reading level, which means text he can comprehend AND read with 98-100% accuracy. Lots of independent reading builds fluency, stamina, and vocabulary. We call that HIGH VOLUME / HIGH SUCCESS reading experiences. A balance of independent and instructional level text gives readers a chance to practice new reading skills and stretch themselves. Look under the FAMILIES tab for a resource that will show you examples of different levels of text according to guided reading levels. I will come back to MOTIVATION and reading in another week or so. Just wanted to share this info as we close out the first 9 weeks of instruction and will be talking with families about guided reading levels. This site is a resource for teachers and families to help foster Venable students' love of reading and learning.